Jalagewadi village has a history that dates back to many centuries. It has been almost 68 years since the State Transport came into existence in the state of Maharashtra. 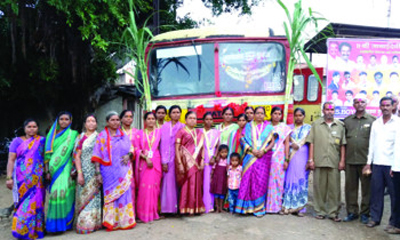 However, the inhabitants of the small village of Jalagewadi, situated at the foothill of Patan, Satara, had never seen an ST bus in their village. The local Tanishka Foundation members hence decided to resolve this issue, and finally, a state transport bus was welcomed with fireworks by five villages in the neighborhood. Jalagewadi, which is nestled at a foothill near Chafal, saw its inhabitants walk for about 5 km every day as there were no facilities located nearby. All these years, students, patients, and ladies had to plod through muddy tracks to nearby villages. However, recently after the construction of dam downhill Chafal at Uttarmand, a road was constructed between Jalagewadi and Mathnewadi. Villagers demanded to have a state transportation facility on the same. After following up with local government officials multiple times, the demands of the villagers were still not fulfilled. At last, the members of Tanishka Foundation from Jalgewadi decided that they will figure out this issue once and for all. They constantly got behind the Area Controller, Patan, requesting him to process the application. This led to the inauguration of State Transportation facility between Umbraj, Jalagewadi, and Nanegaon.